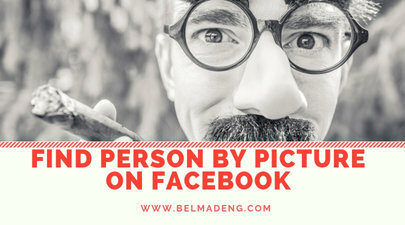 Find Person by Picture on Facebook: Let's get started on how to find a person by a picture on Facebook. When you register an account with Facebook, you will be presented with many options for finding friends. After adding your friends on Facebook, you can engage and interact with them through your Facebook profile. - Type in your friend's name on the search bar. Once you start typing, Facebook will begin to generate results for the most likely query based on your profile information. Facebook is more likely to suggest friends who are from your own country or city or friends who share the same college or workplace. - Type in your friend's email address into the search bar. If you know your friend's email address, you can also type it directly into the search bar. Their profile will appear only if the email address you typed in is the one they have linked with their Facebook account. - Add them. Once you have found the correct profile, click on it and navigate their profile page to the “Add Friend” button toward the top to send a friend request. - If the person is a new or long lost friend or someone who you haven't seen in a while, it is considered polite to send them a message along with your request. Help them remember who you are, so they do not deny the request by mistake. - Click on "Find Friends" at the top right of the Facebook tab. The page will refresh and Facebook will generate a list of “People You May Know” based on the information in your profile. - Navigate to the “Add Personal Contacts” box. You will find this box on the right-hand side of the screen. This box will show the email address that is currently linked with your account. - Import your email contacts. Follow the directions provided by Facebook to import the email contacts from the email address of your choice. - Directions may vary depending on your email service provider, For example, if you use Gmail, you will be required to log in to your Gmail account, click on "Export" within Gmail, and select the contacts you want to upload to Facebook. - Browse the friend suggestions provided to you by Facebook. Facebook will search for your friends using the email addresses and names that were imported from your email account. - If you can’t find the person you are looking for by any of the previously mentioned methods, it is possible that they do not have a Facebook account yet. You can take the opportunity to invite them to join you on Facebook. - Click on 'Find Friends'. This button is in the upper right corner of your Facebook tab. - Navigate to the "Invite Your Friends" box. You will find this box at the bottom right-hand side of the page under the “Add Personal Contacts” box. Here you can access a search bar, which allows you to enter phone numbers and email address of people you know who you would like to invite to Facebook. - Type your friend’s number or email into the search box and Facebook will notify them that you have requested their presence on Facebook. - To invite more than one friend at once, insert a comma after each email address or phone number.